Treasure and XP are the two things you probably track at your table religiously. The FtP crew does treasure tracking differently than some, and we’ve had a lot of questions asking about our method. First, the easy part: I write down what we find. At higher levels, writing down that you found a 2 GP (gold piece) dagger probably isn’t worth it, but things add up, especially in Adventure Paths. So I write down pretty much everything. Along with what we found, I make two additional notes when we find something: Is anyone using it, and who (usually with the first letter of their character’s name, though for Mummy’s Mask I do the first two letters) and whether it’s an art piece. Art pieces sell for full value, so I note if it’s art for later tabulation. Noting who took what items from the communal stash of loot is important, as we deduct how much that item is worth from the person’s cut. So if I’m taking a Masterwork Dagger we found (sell value: 302/2 = 151), then I will get 151 GP less of gold when we go off and sell everything. (Optional) Get a physical copy of Ultimate Equipment. I find the print version is a lot easier to use, especially when I’m flipping back and forth doing the cost of magical weapons and armor. Now comes the fun part: totaling it all up. Grab the calculator, and put everything in. For art pieces or raw gold pieces, I put the value in twice (this will make sense in a second). I write down the total, then divide that number by two, giving me the total sell value for everything. Next, if you have a player who has taken Leadership, and thus has a cohort companion who runs with your group, we give the cohort 10% off the top. This helps keep the cohort up with the needed gear for their level. To get a base total of gold each person should receive, we divide what’s left by the number of players in our party. This is how much gold they get if they took nothing from the treasure. 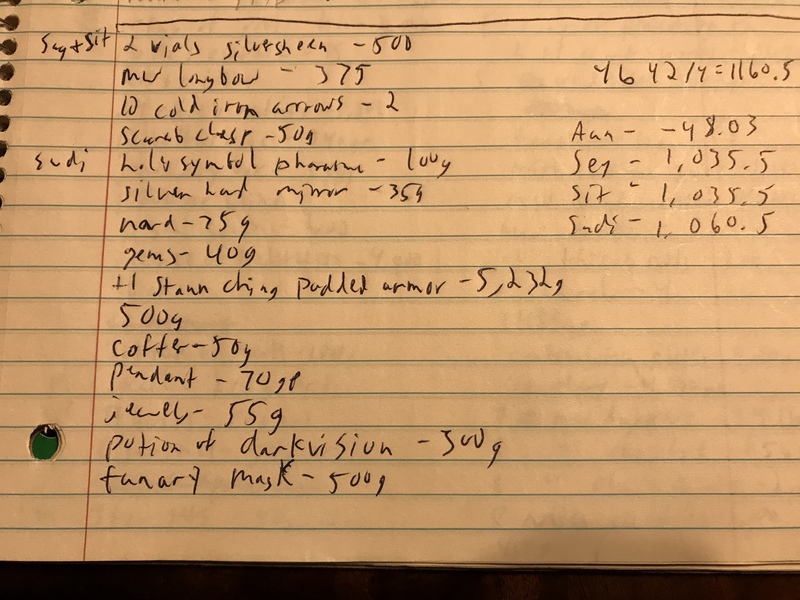 For those who did take from the treasure, I sum up the listed value of all the items they took and divide that number in half, then subtract that from that player’s base total of gold. To properly set the scene, Onuris started this round of loot at -1,208.57 GP (he owed the party that much for the Scarab shield he took previously). 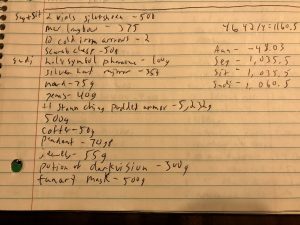 From the notes in the margin, we see that Sagira and Sitra have each taken a vial of silversheen (retail value: 250 GP), and Sudi has taken a silver holy symbol of Pharasma worth 100 GP (holy symbols can be given back to their church at full value). The total amount of gold for what we found was worth a grand total of 4,642 GP. Divided into 4 parts for our four adventurers, each person gets 1,160.5 GP. At least, before we factor in what they took. For Sagira and Sitra, they took 125 GP worth of treasure from the pile, so we deduct that from the 1,1160.5 GP they would have gotten, for a total of 1,035.5 GP for each of them. Sudi is easier, since we just deduct 100 GP from his total, leaving him with 1,060.5 GP. Poor Onuris, whose name Jordan didn’t even get close. Even with the 1,160.5 GP added to his tab, he still ended up owing the party an additional 48.07 GP.